The "helpful" FAQ page says nothing that isn't said or implied in the email. In short: Profiles are going away, yes, they're going away, yes, all the features of Profiles will be gone, yes, you're screwed if you rely on Profiles. Of course, they took a little longer to say that, but you get the idea. I don't know about the average NetFlix customer, but Profiles (multiple queues) are an essential part of the way I use NetFlix. I have four queues -- the "family" queue, which has movies for my wife and I and the family, my "workout" queue which contains movies that I think are good for workouts (and that nobody else in my family wants to see -- alternated with MacGyver), plus each of my kids have their own queue. They're responsible for their queues, including returning movies after they've watched them. 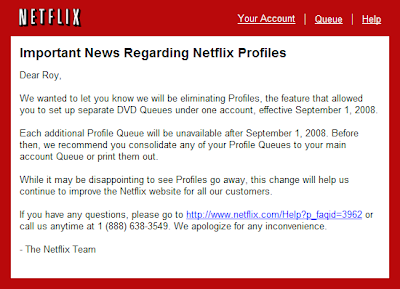 But, NetFlix has decided to kill the feature in order to "improve the NetFlix website for all our customers." How exactly does that work? You take away a feature that I rely upon and somehow that makes the website better? And I love that amorphous "better" -- trust us, it will be "better" in some unspecified way. What feature will they give me to replace it? Will they provide a quick way to reorder my movies, because it sure seems to me that, without queues, I'm going to be constantly reordering movies in order to make sure I get an appropriate replacement movie whenever one gets returned. Are they going to provide a feature that allows me to give my kids access to the queue, without letting them remove movies I've added or view R-rated movies? Or am I just screwed? Or have they just decided that I'm not their target customer and I don't matter enough? Is it a tiny percentage of customers who were using queues? That won't make me happy, but, if that's the case, at least they could be honest about it. Underneath all this, I'm really annoyed by the statement that they're improving the "NetFlix website." It makes me think that, after all this time, they don't really understand their own product. I could care less about the NetFlix web site and I bet that's true of 99% of their customers. I use the NetFlix service. The web site is just the way to get to the service and that's true whether the service is DVDs by mail or movies delivered over the Internet. To me, an important part of the service is a slightly better version of what we had at the video store -- the person who returns a video gets to pick a new one. For people like me, the removal of multiple queues makes the NetFlix service worse than the video store. I don't think that's what they want. I've really been quite happy with NetFlix. I was just about to buy a NetFlix box for my TV, despite the limited number of available movies. Now I'm going to rethink that. Final thought: It's possible that NetFlix has some amazing new design that will give me all of the benefits of Profiles in a different way. And that's what I care about -- the benefits, not the feature. But, given their messaging, I doubt that's the case. NetFlix, care to enlighten us? I am pissed off at Netflix. Not so much that they are removing the profile feature, but how they're handling it. If they wanted us all to have individual accounts, fine, but at least give us the ability to transfer a sub-user into it's own account. Three years of ratings, reviews, and a large queue just deleted? Screw you, Netflix. You may save your queue and ratings information from a netflix profile, and optionally move them to a new account, with the netflix_mover program ( http://is.gd/Dq5 ). While currently a command line program, we are planning a web interface to make it easier to use.